Mr. And Mrs. Teodoro delos Santos, Bantay Bata 163’s long time partner, won the 2018 Huwarang Overseas Pamilyang Pilipino Award held recently at Movenpick Hotel. Teodoro delos Santos is an ex-seminarian who worked with Task Force Detainees before he came to work in Saudi Arabia. Sylvia Delos Santos is a music teacher from St. Scholastica's Academy before going to Jeddah to join her husband abroad. In 2005, they launched Serenata, a non-profit performing group composed of children’s choir, string orchestra and male choir. Serenata has received different citations and awards for its world-class performances. In fact, Serenata was recognized as the Lingkod sa Kapwa Pilipino Awards (LINKAPIL) during the 2014 Presidential Awards for Filipino Individuals and Organizations Overseas. As part of its advocacy, they have been partnering with ABS-CBN Lingkod Kapamilya Foundation’s Bantay Bata 163 through its Bantay Edukasyon program. It is a scholarship program that sends deserving Filipino children to college. 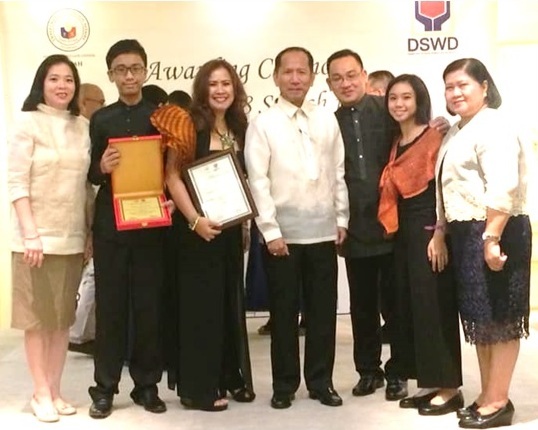 As the winner of the search, the Delos Santos family will be automatically nominated to the Model OFW Family of the Year Awards or MOFYA, an annual, nationwide search conducted by the Overseas Workers Welfare Administration (OWWA) to recognize outstanding families of Filipino migrant workers who have shown unity, financial stewardship, socio-civic involvement, and entrepreneurship. Huwarang Overseas Pamilyang Pilipino Award is organized by the Philippine Consulate General and the Office of the Social Welfare Attache in Jeddah, Kingdom of Saudi Arabia.